I had an absolutely delightful time at ENAR this year. Lots of talk about the intersection between data science & statistics, diversity, and exceptional advancements in statistical methods. I loved it, but let’s see what others were saying! Check out this word cloud of the most commonly tweeted words. Since there was quite a bit of twitter action, I thought I’d do a quick tutorial in scraping twitter data in R.
Go here and create an app - this will give you a Consumer key, Consumer secret. We will use the rtweet package to scrape the tweets using the search_tweets function. My original tutorial used twitteR, but Maëlle kindly pointed out that it is on the way out and rtweet is the better option, so it’s been updated! 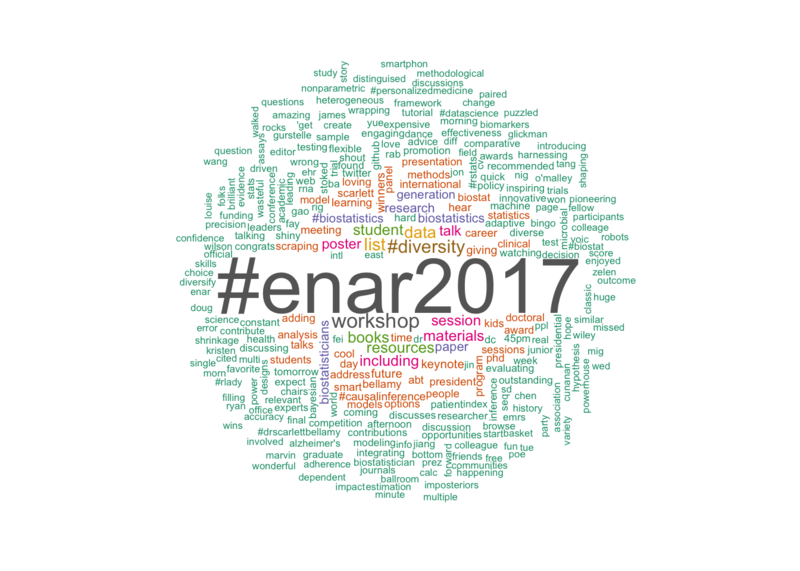 If you would like to practice with the ENAR tweet data, you can load mine in with the following code & continue with the example. Now we need to corral these tweets into something we can analyze. We are going to use some data-wrangling packages (dplyr, purrr😺, and stringr) as well as Julia & David’s tidytext. For more details on how to analyze text, check out their book Text Mining with R, the code below is modified from one of their examples. We will then use the wordcloud package to display our results. We are going to get rid of unwanted symbols and links, split the tweets into individual words, and filter out some stop words. You did it! Easy as π. For giggles, let’s try another word cloud package wordcloud2. This one is interactive (but not on CRAN, you can install using devtools::install_github("lchiffon/wordcloud2")). For a word cloud similar to the one above, we can use the wordcloud2 function. Try the following to make an R shaped cloud using the letterCloud function!